Anytime I combine the colors red and white, I immediately feel like Snow White, so of course this ensemble was no different. There is something fun about feeling a bit whimsical on an otherwise normal day, floral crown and all. I am currently obsessed with this flowy Free People dress. I practically swim in it, but thats what I love about it. It possibly would have been a bit more flattering pairing it with a fitted jacket, rather than this over-sized one, but lately I have been all about comfort and warmth. Anyway, hope you all are having a wonderful and fabulous Monday! You look amazing!! Gorgeous coat and necklace! you are absolutely amazing (just wanted to let you know) keep up your good work! everything about ths is just adorable, the crimson red in the over sized coat, the peak-a-boo effect of your socks, the crown of roses... where did you get that crown? I want it! Hope you have a nice monday too!! The white and red is so sweet. and the flower crown is cute too. Lovely look. I like the look of the oversized jacket. Sometimes things don't have to be the most body-flattering choice - they can just stylistically look cool! I really love the mix of red and white here too. Your floral crown is gorgeous with this. you look lovely with this head band! You look pretty Snow White-y! You've definitely got the coloring! SO pretty! You definitely would make a great Snow White! I love this outfit. 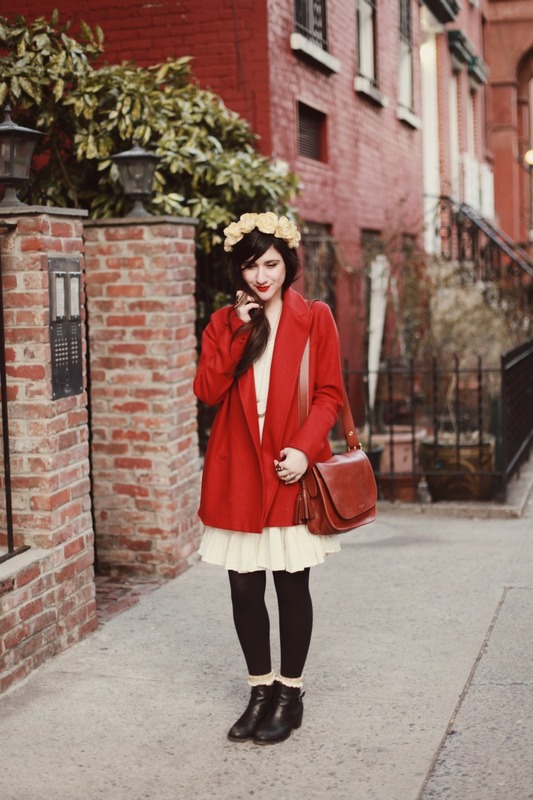 whaou, ce look est superbe, j'adore la veste rouge avec la couronne de fleur!! such great photography and a lovely colour scheme!! First time I've visited your blog and really taken by the effort that goes into it. keep up the good work! 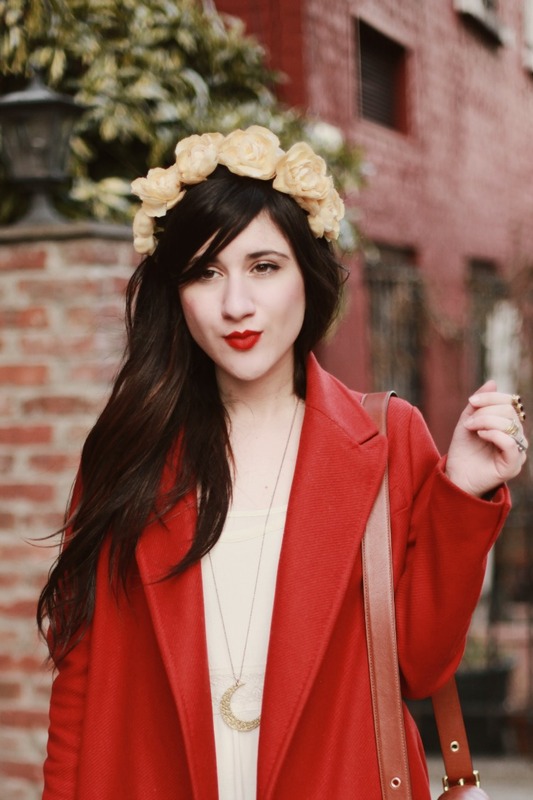 your floral crown is the best! lovely outfit! perfect from head to toe! You look so beautiful and ethereal Bonnie! Great coat, I love it!! you definitely remind me of snow white actually so this is perfect! I love your Free People dress! It looks very feminine. 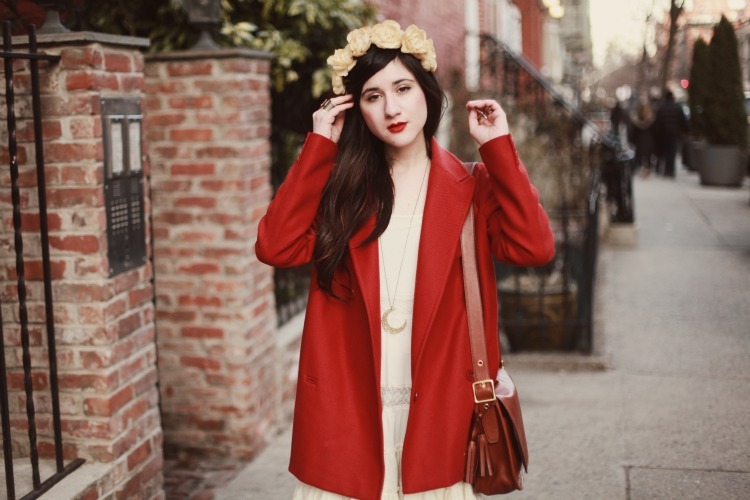 I paired red with a frilly white blouse in my last post but unfortunately didn't look or feel like Snow White, though I love the thought. You, however, can pull it off. You do look a bit like Snow white in that pretty dress with your floral crown! i love your coat, so spring like.